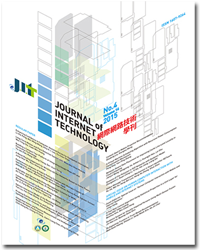 The Journal of Internet Technology (JIT) accepts original technical articles in all disciplines of Internet Technology & Applications. Manuscripts are submitted for review with the understanding that they have not been published elsewhere. Each author is advised to submit the manuscripts, typewritten, double-spaced , in ps, doc, or pdf formats to the executive editor for review. Original drawing need not be sent until the paper is accepted. Once accepted, the manuscript should be submitted as a Microsoft Word or other WORD-processing file and send it through electronic mail along with short biographies and photographs for all the authors. Authors need to pay the publication fee. The author(s) will be responsible for proof-reading the paper. All copyright ownership of the paper will belong to the Journal once it is published. There are six issues a year for this Journal and reviewing results will be provided within six month for most of the submitted manuscripts. Details of electronic submission are shown in the journal homepage. Outstanding papers will be selected from those accepted by and presented in BWCCA 2018 & 3PGCIC 2018. Each selected paper ought to be substantially extended, with at least 40% of difference from its conference version.